When we went to bed the night before we were hoping Elder and Aldo, our guides, were joking about the early morning wakeup call but, true to their word, we were awakened a little before dawn by a loud voice and a couple of whacks on on the outside walls (there were no doors, only a fabric drapes shirred across each room’s entry). I probably slept a total of two hours during the night, but there was no way to get away with burying my face deeper in the pillows or I would lose my one day opportunity for jungle adventure. So we rolled out of bed and dressed in clothes that we’d laid out the night before, damp from all the moisture in the air. We had to be quick as we were all to meet at the lodge where I lathered myself with sun screen and insect repellent and booted myself with the boots assigned the previous evening to wear during our stay. 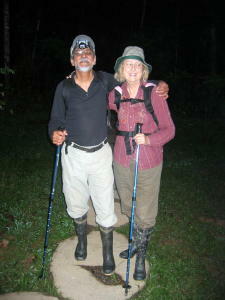 Jungle Jim and Jane, with backpacks on and hiking sticks in hand, were good to go. Breakfast would have to wait until we returned, but I’d grabbed a banana from the fruit basket in the dining room, and Hubby had stashed granola bars in his pack. 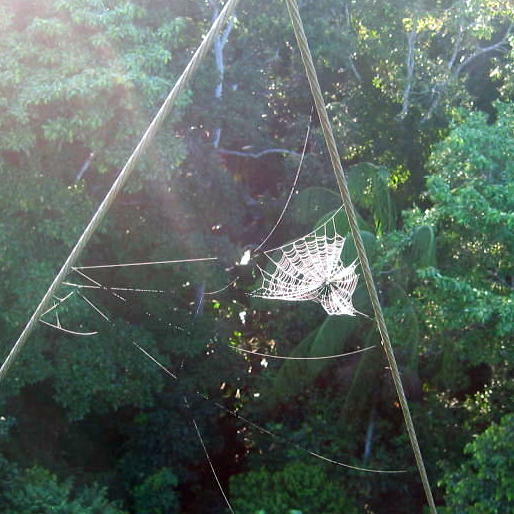 This is it, the 100 foot canopy tower I wasn’t sure I’d be able to climb, but the banistered staircase helps make you feel fairly secure while you climb from one platform to the next, making it pretty easy–almost easy as eating a piece of cake. Now and then toucans, parrots or macaws were seen flying across the treetops. Apparently the rest of the animals were too shy to show themselves, and the jungle provides lots of places to hide. I’ve always admired the intricate beauty of spiderwebs and had to stop to admire and photograph the early morning handiwork of this industrious spider. I remembered the times as a child I would reach out and mess them up so I could watch the poor mama spider spin them all over again. 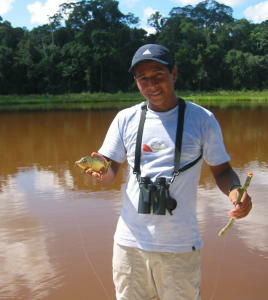 Our guides, Elder and Aldo, are both members of nearby communities and they also grew up along the Tambopata river. When he was a young boy about nine years old, Elder’s grandfather taught him he should look for a large stick if he ever came across “Yakumama” (Quechuan word for mother of the water or Anaconda) so he could hit it. Apparently that’s supposed to scare it away. 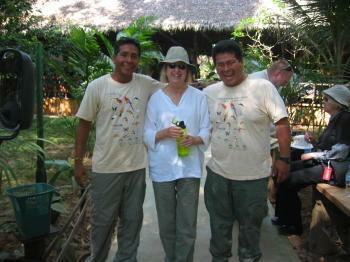 As the day progressed, we learned more about the communal reserve ecotourism project. For instance, there are regulations in place forbidding members to hunt in the reserve or fish with nets in the lake, or to cut forest around the nests of the illusive harpy eagle. Because the whole community is involved in the project, when someone ignores it, the whole community views it as a problem. This has resulted in drastically reduced infractions. 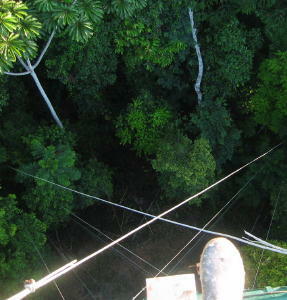 That’s my boot sticking out after we finally reached the top platform and looked down on the trees. I am slightly acrophobic, but I was so taken with the fact that I managed to get that far without chickening out, then slowly looking down and moving slowly, I got over it enough to enjoy it until after what seemed like an interminable length of time for 13 people (our entire group and the two guides) to stand in one small space. We finally climbed down carefully and walked back to the lodge for a hearty breakfast which was sorely needed at this point. I think the distance we covered was about a mile each way, so immediately after breakfast we all went back to our rooms where Hubby collapsed in the hammock and I fell into bed to rest a bit before the next hike. The next activity was another hike–this time to the Condenado Lake where a catamaran (raft) awaited to take us around the lake to see if we could find any wildlife. The sun was already high in the sky and I was feeling the effects of all the walking plus the heat and humidity, and hoping with all my might that I wouldn’t develop diarrhea as a few other members of our group had, because if you had to go there was no place to go except behind a bush or large tree. By the time we arrived at the dock area where the boat was waiting, Marta wasn’t feeling well and had decided she would wait onshore while the rest of us, minus Robert and Mary who’d stayed behind at the lodge to rest and enjoy their hammocks, went on. Later I’d wish I’d stayed with them. There didn’t seem to be any animals around, so after a little tour looking for sea otters or other wildlife of interest, Elder and Aldo cranked up the motor and took us to a spot to show us how to fish for piranha, which seemed to be the only fish biting in the area. Unfortunately, ‘though we all tried our hands with the makeshift fishing gear (one made with one of our walking sticks with a line and sinker attached to it), no one was successful except Elder. My fishing experience is limited to a cane pole with line and sinker outfitted with a cork bobbing cork to let me know when a fish strikes. Without one, I don’t catch fish, I feed fish. Try as I might and not at all surprising to me, I just couldn’t get the hang of striking the water with the bait just so in order to make the Piranha want to grab it in their mouths. Now I was beginning to feel very hot, very tired, and beginning to hate everybody who seemed to be enjoying their fruitless fishing, all the time wondering how in the world I would ever make it if we stayed out much longer. I was really happy at last when someone suggested it might be time to go back and check on Marta. Back at the dock Marta was waiting in the shade and was fine, or said she was, but on the way back nature continued to call her name several times, and eventually I was forced to beg help in locating a place to pee. What I didn’t know at the time, the anti-altitude sickness pill I’d taken that morning to prepare for tomorrow’s high altitude in Cusco was a diuretic. When I finally got back to the lodge, I knew I was done for the day. After spending the rest of the afternoon in bed napping, I felt pretty good by dinnertime, but to my ever lasting chagrin, I missed the three activities for the day that I’m sure I would have enjoyed far more than either the canopy tower or Pirahna fishing. I missed seeing the Shaman at the Ethnobotanical Center where he showed how he produced medicine from forest plants. I missed the farm where specimens of just about every plant and tree in the Amazon grew, and I missed out on the evening boat ride where a fairly large yellow Caiman was spotted. The next d ay, Friday, after a pretty good night’s sleep in spite of all my napping the previous afternoon, I felt great. 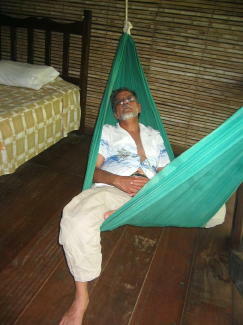 Although it felt like a week at times, the total time we spent at Refugio Amazonas was two nights and one full day. A short time, but long enough to become so fond of both Elder (left) and Aldo, whom I affectionately called my heros, who were both such gentlemen who helped me out of more scrapes than you can imagine on all those slippery river slopes where I had so much trouble with my balance. Plus they found the best upturned giant tree roots that made for the best outhouse in the whole jungle. Ohhhhh, what a relief it was; I’ll never forget it. Hubby and I invited them both to visit and stay with us if they ever come to the U.S. And then we were off to the airport in Puerto Maldonado and electricity and hot running water in Cusco. To sum it up, what was to have been the highlight of the trip for me was somewhat disappointing, but I wouldn’t trade the experience for anything in the world. This entry was posted in International Travel, Musings, Peru by Alice. Bookmark the permalink. I stumbled on your blog somehow in doing some research about the lodges in Puerto Maldonado and I must say thnaks for the information! 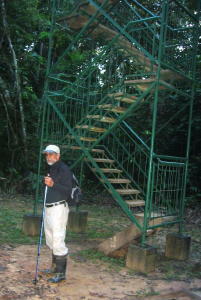 Refugio Amazonas is at the top of my list! We will be going there in December 2009. One question I do have…Are you at the lodge right now? How are you posting the pictures and to the blog? What an incredible trip,it sounds like a fabulous place! It really is a fabulous place, Dan. December, I believe, it will be already in the rainy season but that might mean more wildlife to spot; just be sure you’re ready with rain gear, and you’re in good shape to walk long distances. The lodge is fantastic in spite of the cold showers, the food is good, I can’t think of a thing I’d do different except wish for a younger body to travel in. I’m back home in the U.S. now, and I’m writing about the trip in retrospect with pictures I took while there. Most of the hotels we stayed in, with the exception of the lodge, had wireless internet service available and you could post while touring. The pictures I’m not sure about, but I know some of my traveling blog friends have posted pictures while in China and Alaska, so I know it’s possible. Good luck, and have a wonderful time! Wonderful. Each one of these you write takes us there in spades. You two look darling dressed in your jungle gear. So sorry about the diuretic tho. Yes, I am spending today altering my attitude….brute force if necessary. I really need to focus on the positive as we creep toward the day he get’s laid off.